There’s a storm coming, beginning tonight. It’s a forecasting challenge and I’ve really sweated this one. Depending on where in the state you are, you will see radically different weather. Normally, I don’t second guess myself by looking at the competition&#185. 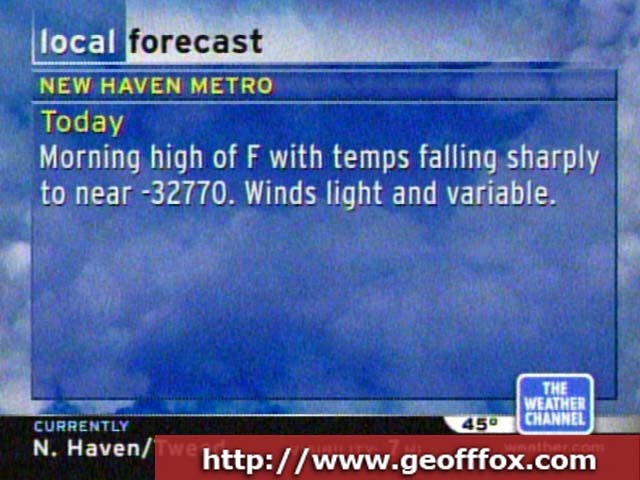 But, this morning when I woke up, as I was tuning around on the TV, I hit the Weather Channel in mid-forecast. I’m sure this isn’t what they meant to put on the screen. It is what you can get if there aren’t actual humans watching what goes out on the air… and with their local forecast, there aren’t people watching at the local level. I feel bad for their viewers who tuned in to see the forecast. &#185 – Maybe this statement isn’t 100% true. I do read the Weather Service’s technical discussions which are often very well thought out, insightful and hint at what their actual forecasts will say. I seldom see the forecasts themselves. Wow, -32770? I should probably dig my thermals out of the closet.